This past weekend marked the yearly celebration of all things Tales with Tales of Festival 2013. I had such a good time that after coming back from the event I decided to sit down and watch the anime adaptation of my favorite game in the series: Tales of the Abyss. And while it is not as good as the PlayStation 2 game that spawned it, it definitely captures the spirit of the game despite several other glaring shortcomings. Luke Fon Fabre starts the series as one of the most unlikable protagonists in all anime. From episode one he is a selfish, spoiled, and sheltered man-child. He whines when he doesn't get his way and treats everyone around him—be that a princess, the pope, or his personal servant—as if they are all trash. While there is clearly some good in him, it actually becomes less and less prominent over the first eight episodes of the series—as he develops a hero complex of sorts which drives him into the jaws of disaster. From that point on, however, he tries frantically to be better than he was—to think for himself and to do what he feels is right. And despite the occasional minor setback, he succeeds. This arc makes him the best developed protagonist of any anime I have seen. I can't think of another anime (or game for that matter) that spends nearly a third of its running time making you hate the protagonist. And when his worldview leads him to commit an unthinkable atrocity, his shift in personality afterward is hardly a “light switch” change—no matter how much he wishes it were one. Instead his development is very naturally realized. Sometimes he does go too far—to the point of grand, suicidal gestures—on his quest for redemption. Other times, he slips back into some of his more selfish attitudes. But little by little, he becomes not only a likeable character but also a truly sympathetic one. In other words, the entire series is pretty much based around developing his character. While Luke is surely the poster child for a well-developed character, the other characters in Tales of the Abyss are interesting in their own right. They have their own tragic histories and secrets to explore over the course of the adventure. Jade's blunt logic mixed with a sarcastic veneer makes him enjoyable every moment he's on the screen. And Tear, the female lead, provides the perfect moral compass for Luke, helping him whenever he strays from his path to redemption. Even the villains get more than a little time spent on their backstories; and when it comes time for their inevitable deaths, it's sad to see them go. 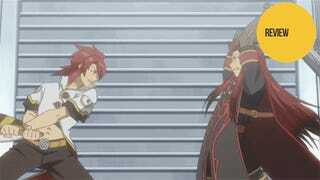 As an adaptation, Tales of the Abyss is very true to the plot of the game—perhaps too true. While it's impossible to get every line and action of a 70-hour game into a nine-and-a-half hour anime, the anime certainly tries. On the plus side, this means it's almost guaranteed that your favorite moment from the game will appear in the anime. Unfortunately, this also means that the characters change locations constantly and what seem like major goals are completed in mere minutes of screen time. If you have played the game, you will have no problem following along; but to someone who hasn't played the game, I fear much of what is going on in the plot would become little more than a mixed-up jumble. For an RPG where you easily spend as much time in battle as you do out of it, there is a noticeable lack of combat in the Tales of the Abyss anime. Nearly all random encounters and the vast majority of bosses have been cut from the story. And what fights do remain rarely last more than a score of hits before they end. Even the grand (false) climax against the final boss at the end of the second act is done in under a minute with less than a dozen blows exchanged in the entire fight. This means that most of this anime is talking, walking, or walking and talking and—as mentioned above—what little action there is, is painfully short. The biggest problem with Tales of the Abyss is a direct result of how much they are trying to cram into the 26-episode series. Simply put, the pacing is downright terrible. Many episodes end with neither a cliffhanger nor a resolution and just seem to end mid-action. Other episodes have a major climax happen in the middle of an episode, and then immediately jump to the next major plot point without allowing the audience any time to decompress. In the end, it feels like a series that never stops to catch its breath—or rather even when it does take a moment to slow down, it's seemingly at random and never lasts for very long. As a person who absolutely loves the game, I enjoyed my time with the Tales of the Abyss anime. It certainly has its pacing problems and seems to cram in far more than is needed in an attempt to stay true to the source material. However, it's still worth a watch just to watch Luke's character development. Moreover, the adventure is a great one and the characters are memorable, one and all. If you have a chance to play the game, that would be my first recommendation; but for those who have already played it or don't have the 70 hours to spend beating the game, the Tales of the Abyss anime is still very much worth a watch. Tales of the Abyss is available on DVD in the United States.